Green drive technology. They have an energy efficient motor so they work with low power consumption. Therefore your pump will cost you less because it has lower power consumption and is an energy efficient pump. because you will run your pump constantly so you do not want to be doing repairs or replacing it on a regular basis. It is weatherproof. Your pump will be out in the elements so you want it to be robust. 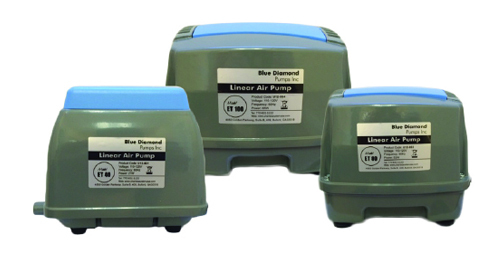 These Blue Diamond air pumps are thermally protected. We have the ET40, ET60, ET80, ET100, ET120, ET150 and the ET200 series Blue Diamond Air Pumps in stock. We can ship them today to anywhere in the continental US. Shipping is free. If you need expedited shipping or shipping to Hawaii, Alaska or Puerto Rico please contact us for pricing.